BAMUM ROBE from Grasslands, Cameroon, 1925-1950. Collection of Marcel and Zaira Mis. Photograph by Mauro Magliani, courtesy of the Los Angeles County Museum of Art. The Los Angeles County Museum of Art (LACMA) has been actively building its collection of African art in recent years, with a new, dedicated gallery and some splashy acquisitions, both ancient and contemporary. But LACMA’s African costume and textile collection remains weak for an encyclopedic museum. Its exhibition “African Textiles and Adornment: Selections from the Marcel and Zaira Mis Collection” was an important step towards righting the balance. The thirty-five objects—all from a single private collection—spanned the late nineteenth and early twentieth centuries, and they were drawn from all over the African continent, with a high concentration of material from central Africa. 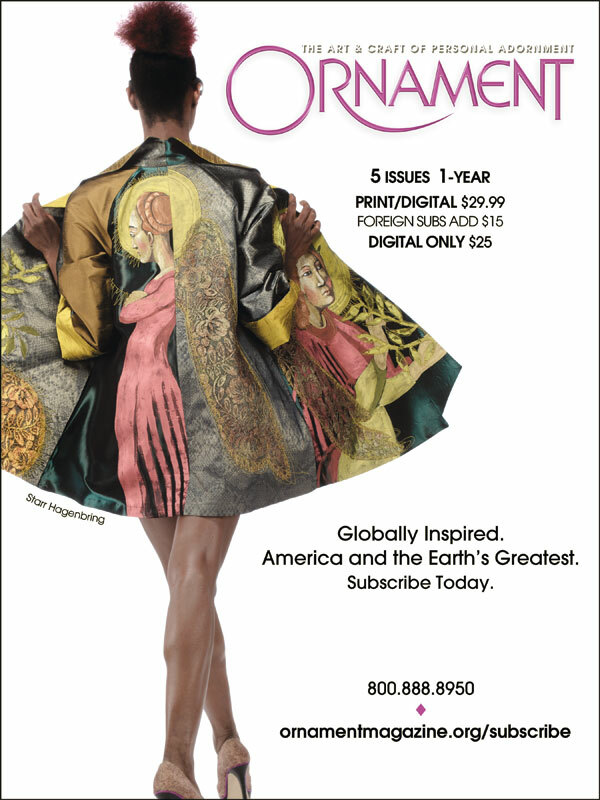 Kimberly Chrisman-Campbell is a fashion historian specializing in fashion and textiles, and a frequent contributor to Ornament. She has worked as a curator, consultant and educator for museums and universities around the world. Chrisman-Campbell is the author of Fashion Victims: Dress at the Court of Louis XVI and Marie-Antoinette published by Yale University Press this year. In this issue she reviews the lush and exuberant textiles of Africa from a recent exhibition at the Los Angeles County Museum of Art.